HCM CITY — The affluent Middle East is a promising market for Vietnamese companies, the Việt Nam Chamber of Commerce and Industry has said. Trade between Việt Nam and the Middle East had gone up sharply in recent years, doubling from 2011 to US$12.8 billion last year, he said. According to Lê Thái Hòa, deputy head of the Ministry of Industry and Trade’s Asia-Africa Market Department, Việt Nam enjoys a trade surplus with the Middle East, which consists of 16 countries and has more than 300 million people. The United Arab Emirates is Việt Nam’s largest partner in the region, with their trade increasing from $4.46 billion in 2013 to $5.6 billion last year. With a per capita GDP of over $60,000 and a large number of immigrants and tourists, the UAE has large demand for various products. “Vietnamese goods such as seafood, garment and textile, footwear, farm produce, foodstuff and household appliances have established a firm foothold in the market,” he said. But despite the increase in trade, Việt Nam’s exports to the Middle East still account for a very small portion of the region’s total imports. The forum was held to further promote economic, trade and investment ties between the two sides, Hưng said. 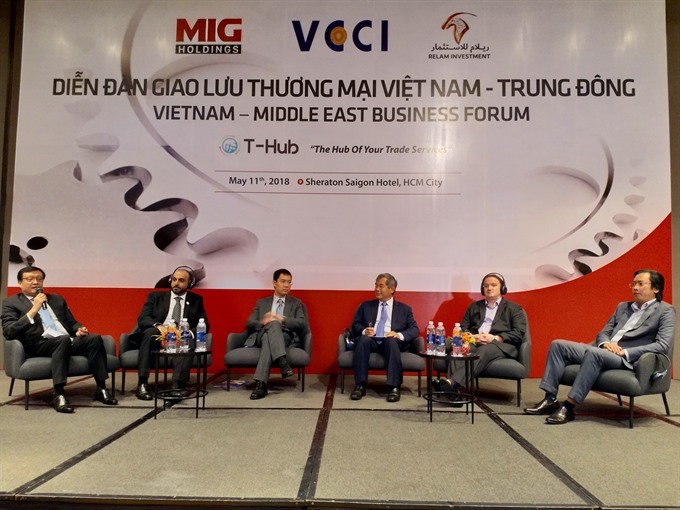 Obaid al Dhaheri, the UAE ambassador to Việt Nam, said as the hub of the Middle East and gateway to Europe and Africa, his country could serve as an entry point to the global market for Vietnamese companies. In turn, "Việt Nam is the gateway to Southeast Asia for UAE firms," he said. When doing business with the region, enterprises must always keep a close eye on its unstable political situation, Hòa warned. They must also understand the regulations of each market and Muslim cultural factors such as not consuming alcohol and requiring food and foodstuffs to have Halal certification, he said. Sharing his experience in doing business with the Middle East, Đỗ Hà Nam, deputy chairman of the Việt Nam Coffee and Cocoa Association and chairman of Intimex Group, which has exported to Dubai for nearly 20 years, said the market had huge demand for Vietnamese pepper, cashew, coffee, and seafood. “To penetrate the market, enterprises should participate in trade fairs in Dubai, where they will meet potential customers. Finding a right business partner is very important," he said. Also at the forum, Relam Investment L.L.C, a partnership between Dubai-based Vault Investment L.L.C and Việt Nam’s MIG Holdings, announced the establishment of Trade-Hub (T-Hub), a full-fledged trading and logistics platform, in Việt Nam to help Vietnamese firms promote their exports in Middle East and other markets.